What perfect spring break weather! There is so much lovely scenery on the coast but you're right lakes have their own beauty. I grew up visiting Cultus and Okanagan lakes but they are both so developed now. Enjoy the rest of the break. My daughter lived on the Sunshine coast for a year, and I visited her there. 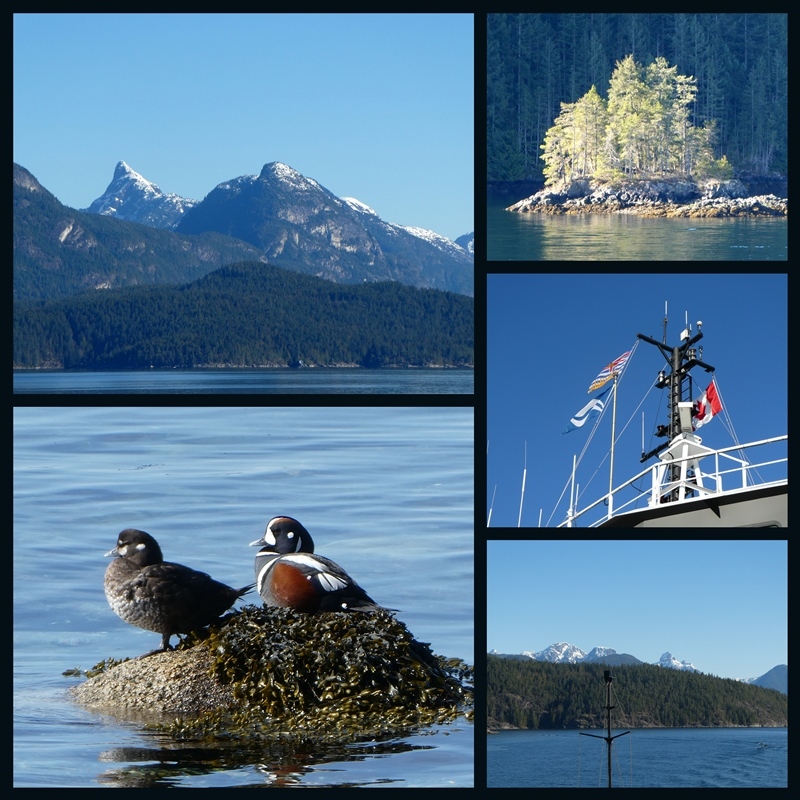 I thought it was so lovely, and even took myself off to Gibsons landing for lunch one day. Happy memories! Gorgeous photos! Such vivid blues. I shall remain hopelessly confused about the geography. I have learned the difference between Vancouver the city and Vancouver the island. It’s only taken me a few years. I’m so glad that you and Tim got away. So needed from time to time. Is it true that you have another week’s break from school? My, my, my what a beautiful post. I so enjoyed my visit and gazing at your lovely photos. I'm never been to Vancouver Island, maybe some day. Thank you for allowing me to tag along on your vacation, it was a pleasure. Such a beautiful trip with so many gorgeous views. Glad you enjoyed it. I'm glad you gave the name of those beautiful ducks, aren't they gorgeous! You live in such a land of beauty, Lorrie. When you wrote that it "was achingly beautiful" that is exactly what I think when you post these pictures. That pic of the tall conifers glistening in the sunshine surrounded by sea is breathtaking. You live in such s gorgeous area - I always love visiting you! Your description of "achingly beautiful" was spot on, Lorrie! I actually got goosebumps in oohing and ahhing over your photos. What a beautiful area you live and enjoy. Happy Spring break to you! Good luck with your blog. I am not very tech savvy! A perfect getaway journey! Achingly beautiful it is.... just incredibly lovely. And what a fun way to travel... circle trips are the best and the ferries really made it magic! I would want to be out on the deck as much as possible, even though I hate being cold. Glad you found a sheltered nook. ...lots of beautiful blues in your neck of the woods! Enjoy your week. Lorrie - thanks for kicking off Mosaic Monday this week in fine style. When I read the title, I had to wonder what it means … now I get it! So glad you had good weather for your vacation, and it made for some lovely reflections in the water. I have to say my favorite is smuggler's cove! Sorry that I cannot help with the layout issue … hopefully someone else will come to your aid! Absolutely stunning blue views and great bird photos! Happy MM. Hello, gorgeous views of the coast and the mountains! What a lovely place to live or visit. Your photos are beautiful! Enjoy your day! Have a happy new week! It really is hard to work on our blogs. I guess the widths are messing things up but it's hard to get it just right. LOVE your fun trip. I grew up spending time at the lake and love it still. I'm just about ready to learn to fish again...I think! Love that Golden Eye...how amazing! Enjoy your week! It sounds like you had a wonderful get away. It's hard to believe it's spring break already when it seems you were just going back to school after Christmas. I think I know how to fix your problem but I could never explain it. Maybe you could get some online help--or google it? Happy Spring! Your photos are achingly beautiful, Lorrie! Those jagged peaked mountains are magnificent. We took a boat ride around some of Puget Sound and up towards Vancouver a couple years ago an found it so mesmerizing. We would love to return to see more of the islands and shoreline in the PNW. Beautiful images! Glad you had a wonderful vacation. You had the perfect week to tour so close to home. Beautiful weather to enjoy the beauty. Creation calls. It's truly amazing. What a glorious trip you took. Love seeing all these beautiful photos of what you saw! I understand the way behind on visiting blogs while you spend time away from your normal digs! You must have had a relaxing time. Thank you for explaining about the geography of the region and about the ferry system that's needed to get about. Beautiful photos! Now you're home I trust that you're having a different, but good week. Wow... what amazing landscape. I enjoyed your post. Lake over Ocean any day!!! I love all those gorgeous photos and thanks for the Canada explanation! Lorrie you truly captured such lovely moments. I adore the shot of the Goldeneye ducks. Have a wonderful weekend. Your photographs are an absolute joy to see.